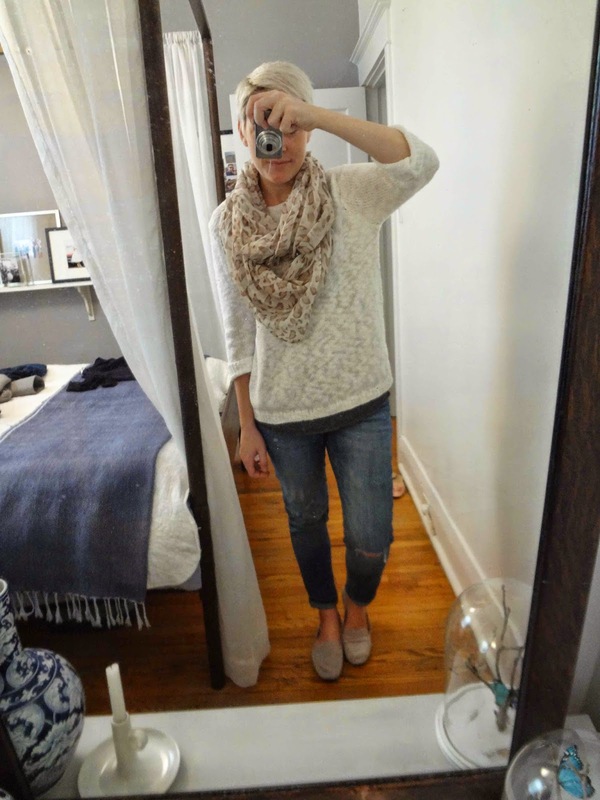 Fall is my favourite season for many reasons, but the clothes are a big part. And not going out shopping is going to be hard (and I'm just starting to realize how hard). This week I needed to buy new shoes (footwear and under garments are not part of the thrift challenge), so I went to the Gap to try on some loafers, and what do you know? They're having a 40% off sale. Ugh! The nerve! I just needed stupid loafers and then I had to be taunted, no, make that, tormented by all the back-to-school blue jeans and the crisp collared shirts and the cute leather bags. I bought my stupid, boring loafers and I left that torture factory! And the next day I went shopping at Value Village. It was my first shopping trip since the challenge began (on August 1st, 2014) and I was so ready to buy some new fall clothes! 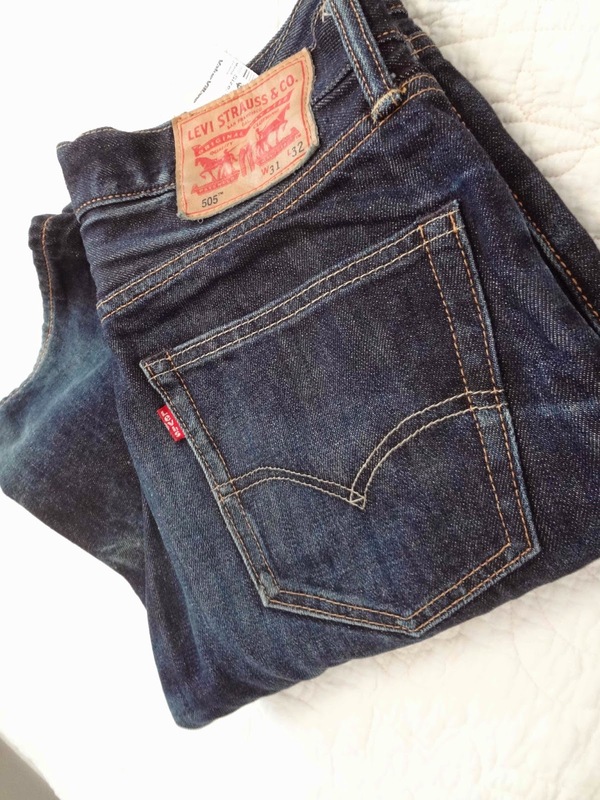 After being horribly tempted by the jeans at the Gap, my first priority was a new pair of blue jeans. Well, what do you know? 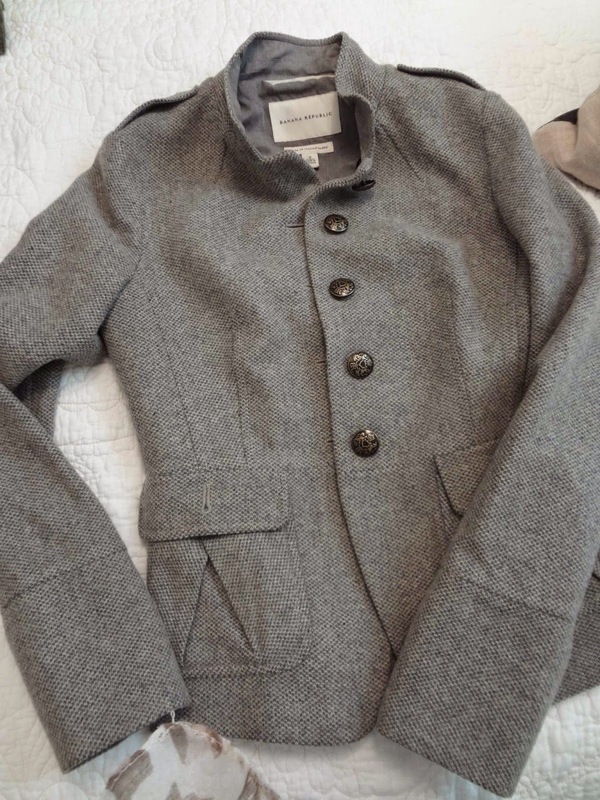 I came out with TWO pairs of jeans, a grey wool jacket (Banana Republic), a moss green lamb's wool cardigan by Coincidence and Chance (Urban Outfitters), an over-sized white knit pullover (no tag, but my guess is Joe Fresh) and a brand new pair of Levi jeans for Chris (they're lined jeans which will be great for winter and they fit him perfectly). All that for $80! I'd pay more than that for ONE pair of jeans! Now let's get down to business. 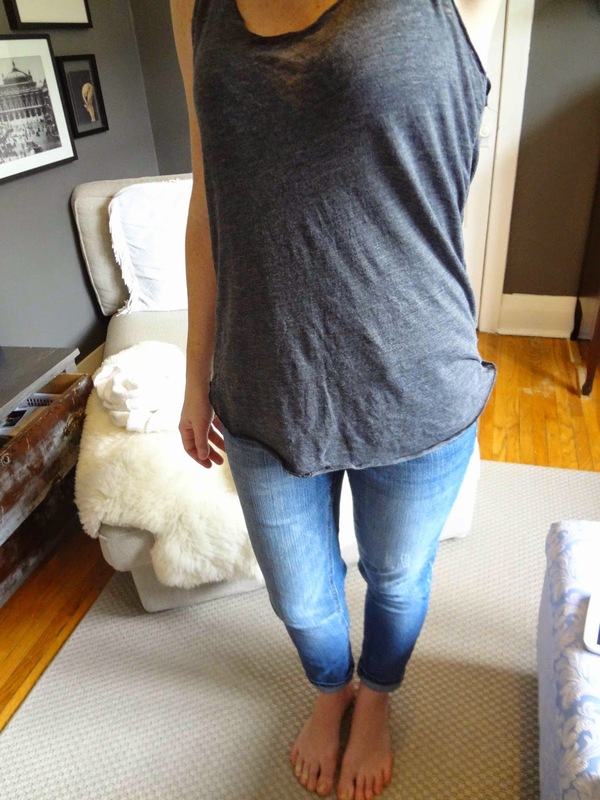 I really want a pair of distressed jeans this season. 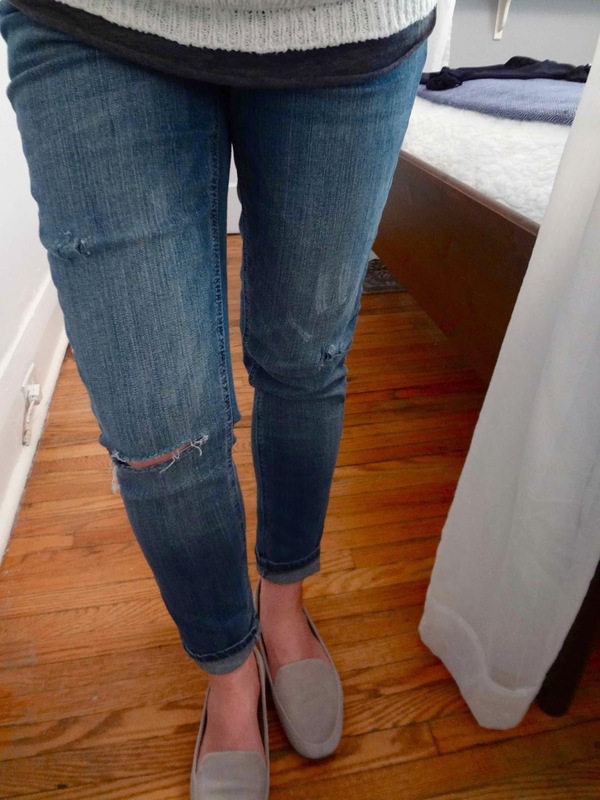 As you may know, I never miss an episode of Keeping Up with the Kardashians, and lately, Kim and Khloe have been wearing these amazing super distressed jeans. 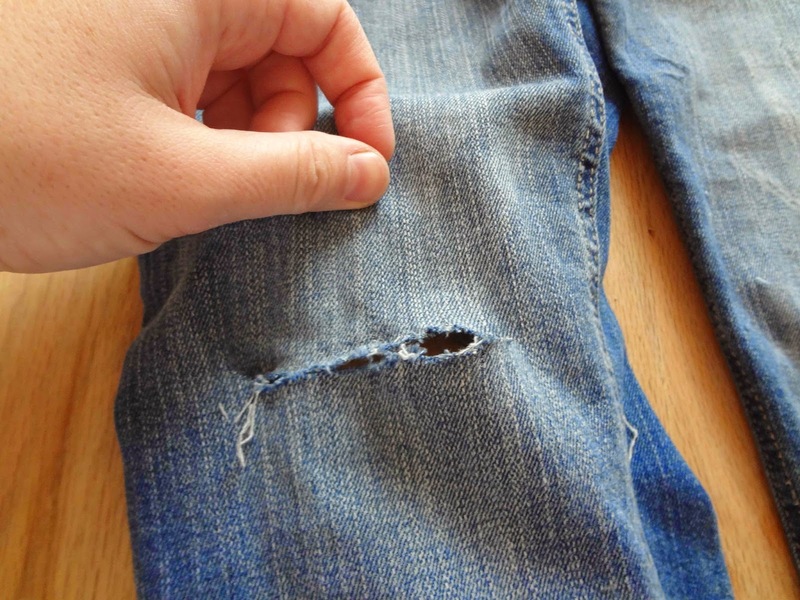 Of course, their blues are more holes than jeans, and while I'm not interested in showing tons of leg (it's just not practical for a Canadian gal! ), I love the look and I wanted to do it myself. Not bad for $7, right? I like that they're faded and light, a look that I think lends itself to distressing. 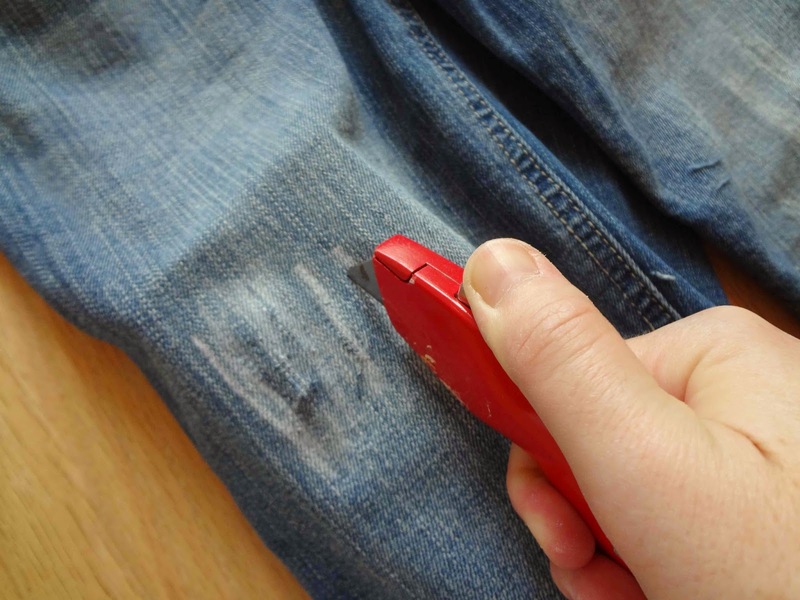 While wearing the jeans, I marked in chalk the areas I wanted to distress. Next, I gathered my supplies: wood blocks, scissors, utility knife, sand paper/ steel wool. 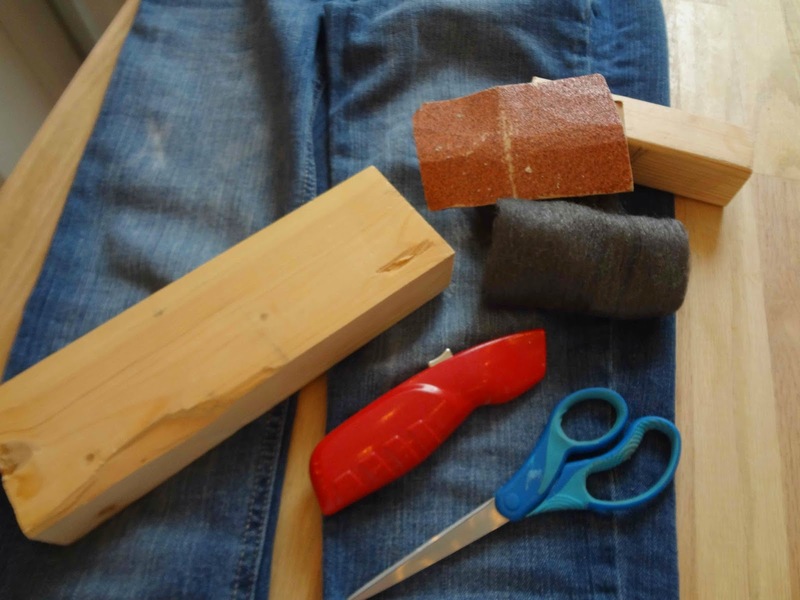 I placed the wood blocks inside the jeans to protect the backs of the pants while I worked. To make a large hole, I started with the wood block under my chalk line. 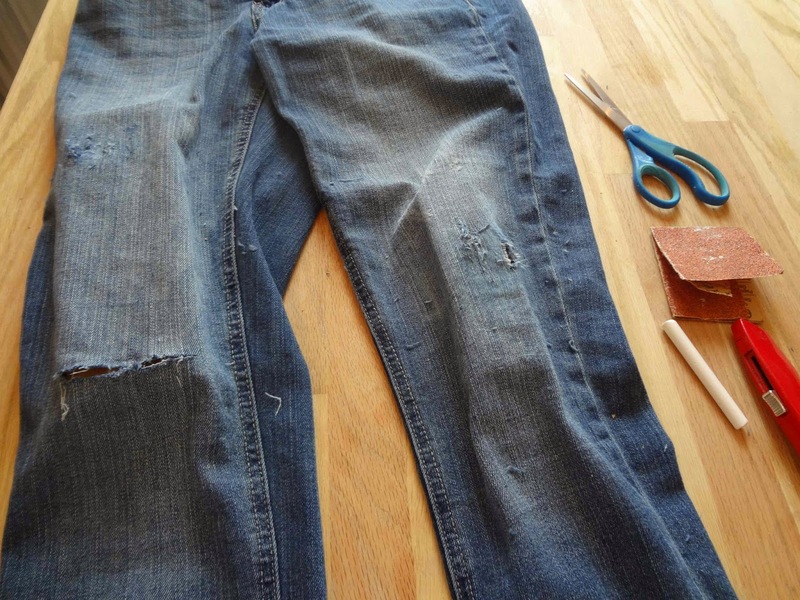 Then, using the scissors, I punctured the denim at one end of my chalk line. 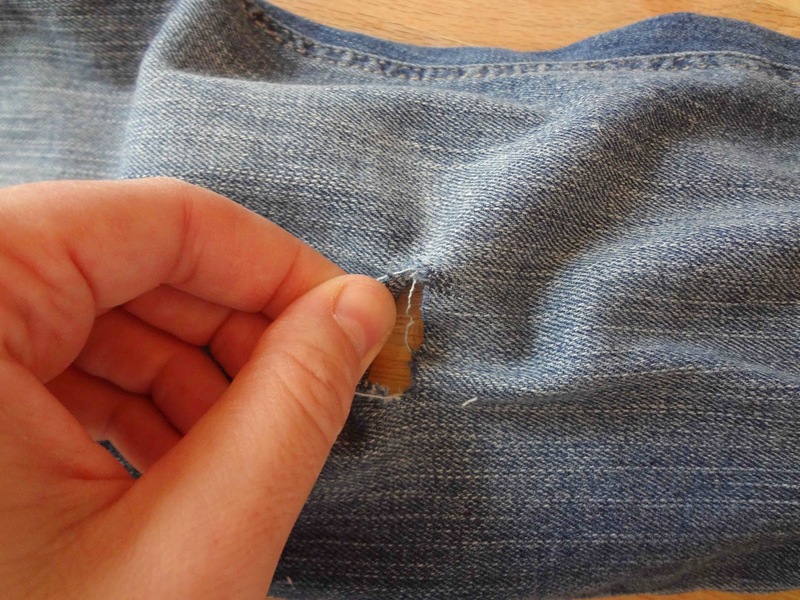 From the puncture mark I used both hands to rip the denim along my line. If I got stuck and couldn't continue to rip, I would cut a little bit with the scissors and continue ripping. 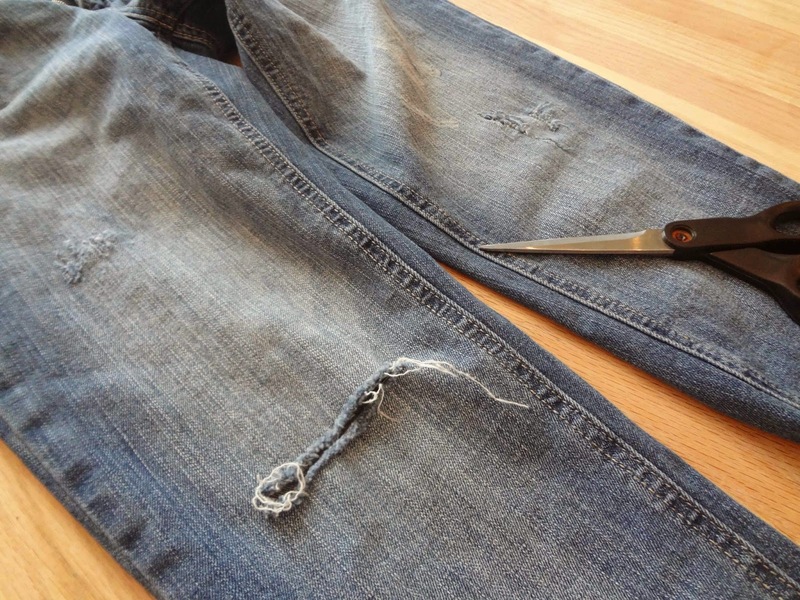 Ripping (versus cutting) will give you a frayed edge and a more ragged look. Now, to make some distressed areas! 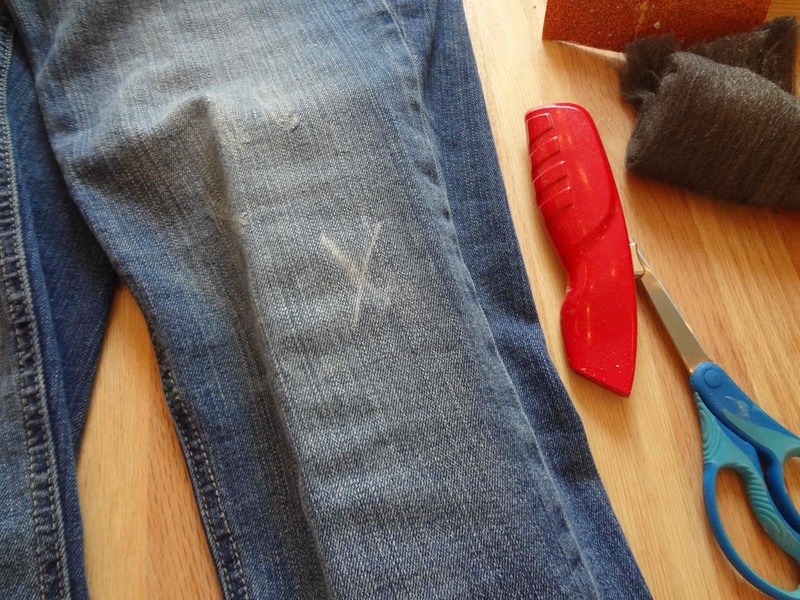 I started by running the knife down the denim in short parallel vertical lines. 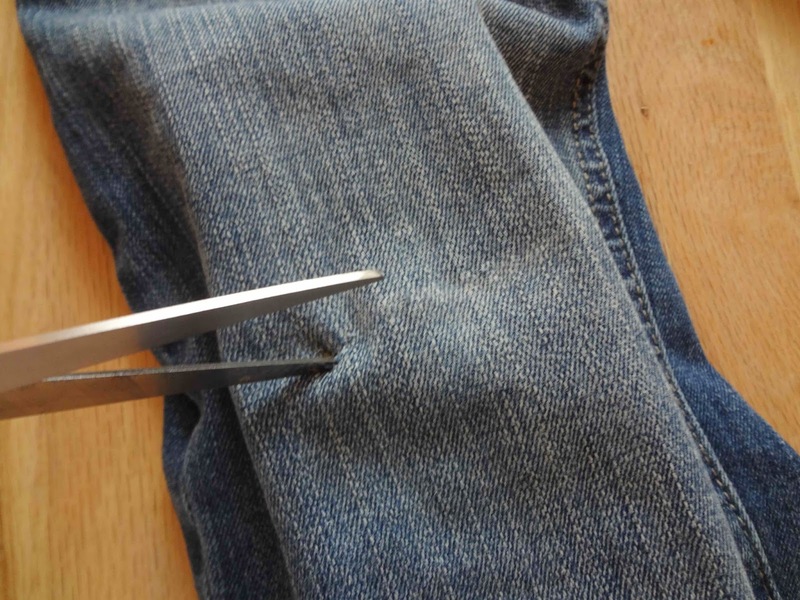 I wasn't trying to cut right through the denim, it was more like scratching it. 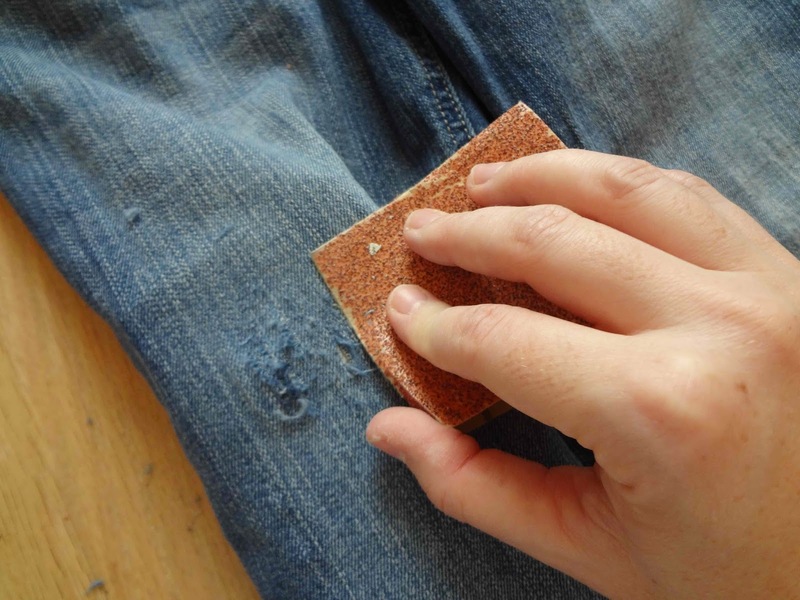 Then I took the sandpaper (I used 60 grit) and ran in across the knife scratches in the opposite (horizontal) direction. I moved the sandpaper back and forth over the area until I achieved a look that I liked. 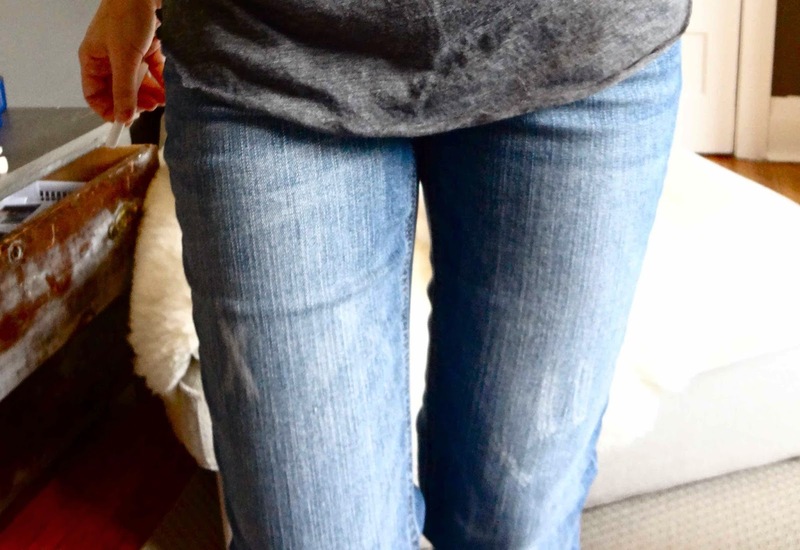 I worked on both legs until I felt like I had distressed the denim enough. I kept things pretty tame, as you can see. The final step? 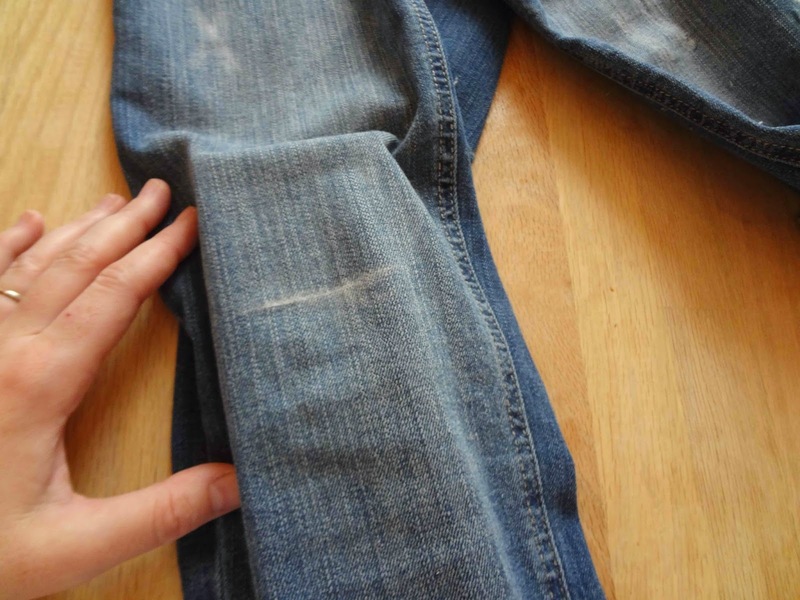 Washing the jeans! (This pic was taken after my pair came out of the dryer). No cut is complete until the washer and dryer have had they're way with it. 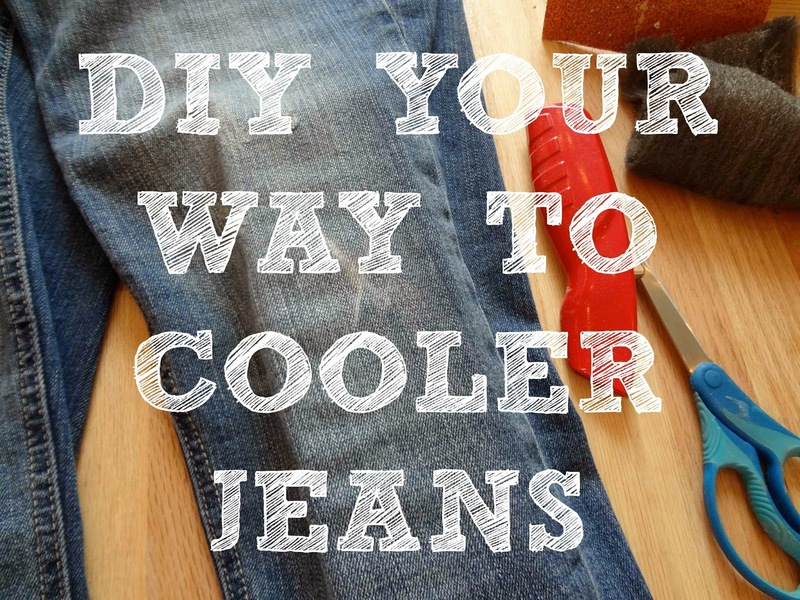 A trip through the laundry will help to fray all the areas much more and the jeans will look legitimately rougher (and cooler). 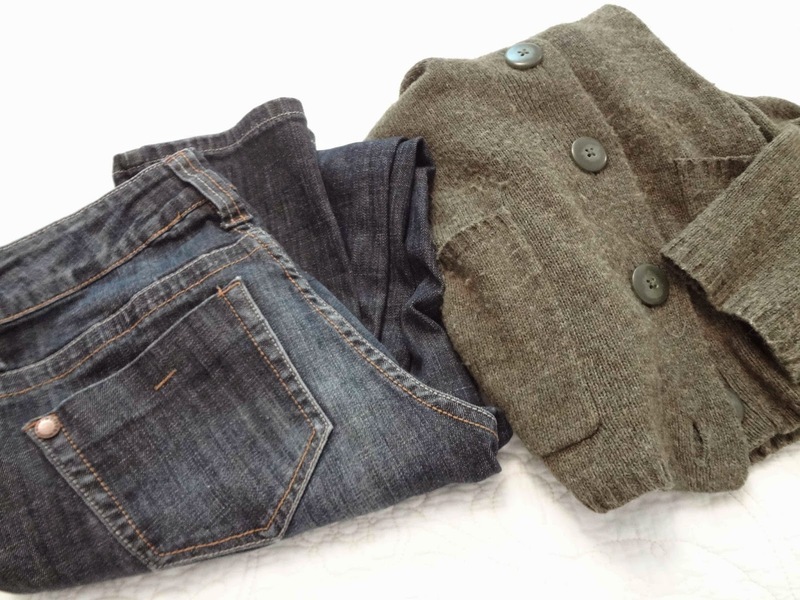 Here are my new awesome jeans! (And one of my fall outfits courtesy of Value Village). 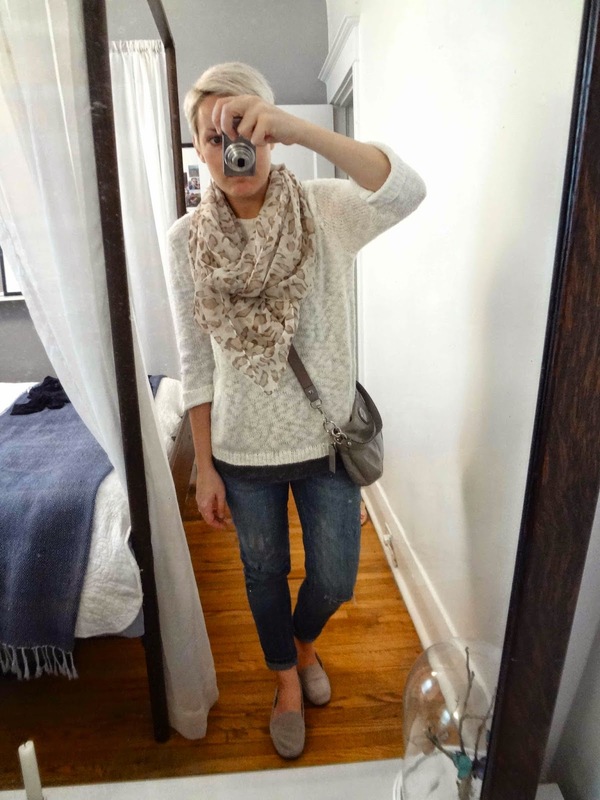 Jeans and pullover, Value Village; tank top, Forever 21; loafers, Gap; scarf, purchased at a boutique. 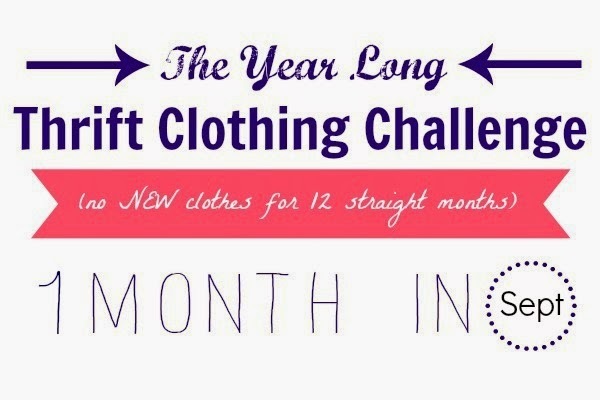 Keep watching the blog for more updates on our year-long second hand clothing challenge! Value Village usually has a lot of great finds! It doesn't seem to matter which Value Village I go to! I agree! There is no such thing as a bad Value Village! We should check out the one in my neighborhood when you are here!